“These dollhouses have many levels and a lot of fun accessories." "Comes with 85 surprises that will keep kiddos busy for hours." "Roominate is a STEM toy that helps promote math and science skills." “This castle has a living room, bedroom, ice room, and a 2 tiered birthday cake." There are many Kidkraft dollhouses to choose from. These large dollhouses have many levels of play and a lot of accessories that are enjoyed for years. They are a fantastic and memorable gift. Comprised of over 85 “surprises,” the L.O.L. Surprise! House is chock-full of exciting and interactive features that’ll keep kiddos busy for hours on end—they’ll love using the working elevator, turning the lamp on and off in the living room, and placing their dolls in the pool and hot tub (for cool and warm water) on the outside patio. Crafted from quality wood and measuring three feet tall and three feet wide, this multi-story dollhouse is painted in bright, cheerful colors, and even includes a moving truck with furniture. This also includes a family of dolls to use inside the house. The fold and go wooden dollhouse is a great portable dollhouse. The set inclues woodern play figures, 11 pieces of wooden furniture (chair, bed, bathroom, toilet, table, tv, chair, etc.) This dollhouse opens and closes so it can store all the pieces hidden inside which is great for travel or grandparents who want to offer their grandchildren a classic toy that does not take up a lot of space. Over the years there have been many collectible Playmobil dollhouses. This large, 6 room, 3 level dollhouse, has a working doorbell and 2 staircases. It includes 2 people, opening windows and lots of detailed accessories. Playmobil sets do need to be assembled by snapping pieces together to build the structure. This can take a lot of time. Additional accessories and playsets can be purchased to enhance the pretend play experience. The HAPE wooden dollhouse has 6 rooms, moveable stairs, and even a solar paneled roof! The dollhouse can be bought with or without the furnishings for each room. Openings on all sides of the house accommodate many children who like to play together. Do not let this basic wooden dollhouse set fool you! While the Haba accessory sets need to be purchased separately, there is no other dollhouse collection where you can buy dog houses, horse stables and even a yoga studio! You can add your own spin with the included decals that give you flowers, birdcages and more. The doll figures are bendy and poseable throughout the home. There many types of Barbie DreamHouse dollhouses. This model has modular pieces making it easy to put together in less than an hour. Kids can use their Barbie dolls and other fashion dolls in the kitchen, living room, and bathroom. There's even a working doorbell, crackling fireplace, and flat screen tv! Disney Princess fans now have the Disney Princess castle of their dreams for Belle, Cinderella, Snow White, Aurora, Belle, Jasmine, and Ariel. The castle is 3 1/2 feet tall and includes 4 different fully furnished rooms. The Fisher-Price dollhouse is a great first dollhouse for toddlers. It has large figures that easy for small children to hold and pose. Different furnishings are sold separately and include a stroller, tv room, sister's room, parent's bedroom, and nursery. This Fisher-Price Little People Big Helpers dollhouse is another great option for toddlers as it encourages teamwork and kindness. Sounds and phrases play throughout the house that teach children to share, and the large pieces are great for small hands. The Fisher Price Little People dollhouse has evolved over time to include many different accessories and features. This 2 piece wooden dollhouse is made from eco-friendly materials. There are 2 pieces, one small and one large, that can be reconfigured together or placed separately. 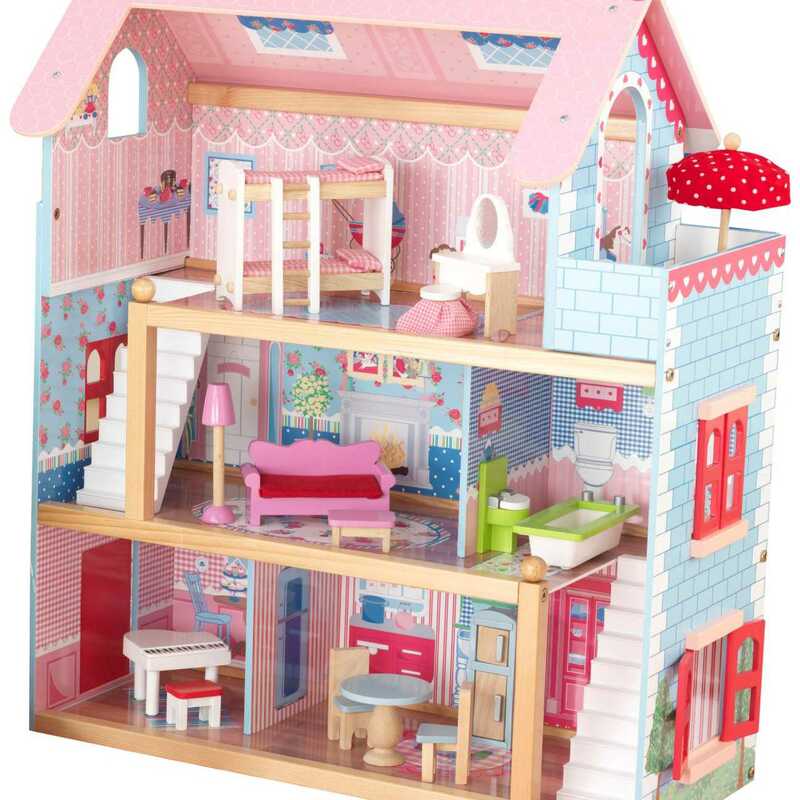 The dollhouse comes with so many accessories that include 5 sets of furniture! Calico Critters are poseable animals that have a very soft, smooth, velvety texture. They will love to play inside this Calico Critter townhome! The lights turn on and off and there are 4 rooms included. There is also a room divider that can be shifted to create an additional room. The staircase and extra floor can also be used to expand the rooms and playspace. The Critters, furniture and accessories are sold separately. The Janod dollhouse has 2 floors and a removable roof. It arrives with 2 dolls and 15 accessories to furnish the house such as a closet with doors that open, a bed, a dressing table with mirror, a couch, an armchair, a lamp, a stool, kitchen cabinets with doors that open, a table, 2 chairs, a fridge with doors that open, a bathtub, a shower, a sink with mirror. This wooden dollhouse is easily assembled with pegs instead of screws to align the floors. The Hearth & Hand Toy Doll Farmhouse (from Chip and Joanna Gaines’ Magnolia brand) is elegantly designed and ultra-chic, with its cream-and-black coloring, adorable outdoor seating area, and pillared front porch—parents likely won’t mind keeping this house out on display, as opposed to tucking it away in a closet. Well-suited for children ages three and older, this lovely-looking dollhouse is over 23" high and includes 12 pieces of intricately detailed wooden furniture, like rocking chairs and a table with benches. There are many non-traditional dollhouses, too! So, why not a treehouse adventure camp? Using LEGO construction bricks, kids build their own adventure camp treehouse that includes a tire swing, slide, rooftop sleeping spaces and a rock climbing wall. With Roominate, kids build their own dollhouse with modular pieces. Then, using motor circuits, kids use electric functions in their dollhouses with windmills, blenders, pottery wheels, carousels, and elevators. Roommate is a STEM toy that helps promote principles of Science, Technology, Engineering and Math. Disney's Frozen fans can build their own 10 inch Arendelle castle, brick by brick. The castle set includes Elsa and Anna mini-doll figures and Olaf the snowman. The castle has a living room, bedroom and ice room and a 2 tiered birthday cake.